I love and need more comfy knit tanks this summer that have a certain edge or oomph to them. This is where my love of sequins perfectly aligns with J.Crew’s recently ostensible obsession with sequins. Plus this tank is made of slub cotton, so you know it will fit comfortably and relatively loosely, while remaining breezy and light. I do like to point out that this picture above reminds me that J.Crew really knows how to take great marketing shots of their products, because the Zafrina skirt pictured with this tank does NOT look that cute in real life. Why do they insist on showing it as an A-line shaped skirt when it’s a droopy tube? But I digress. Get the Sequin Necklace tank from J.Crew here for $64. I can’t get over how pretty this Wild Mushroom color is. I’ve never really seen this color in a skirt anywhere before, but I feel like it could be a great new neutral for me…but more chic and feminine than your blacks, greys, and whites. J.Crew promises that it’s 18″ long with an A-line shape (aka Cotton Nico Skirt reinvented and $5 more), which means this is a potential winner for me this summer. The fact that it’s slub herrington cotton and totally machine washable is icing on the cake. Get it here from J.Crew for $64.50. I realized the other day that I have so many cardigans, but they’re all boring solid colors. I have like 5 black ones alone. Plus for some reason, they are all long. Total lack of wardrobe planning on my part. This Sequin Falls cardigan fits what I’m now looking for perfectly. It’s cut shorter and therefore more casual for summer, the Fawn is a great match-with-everything neutral color without being boring black/white/grey, AND it has the extra oomph of sequins! Get it here from J.Crew for $118. Every time I’m about to make a large J.Crew purchase, I always have one or two items I’m most excited about. These are it this round. Every time I’m on the J.Crew site and I come across this photo, I pause and stare. This outfit looks so stunning yet casual. The matching of the casual but sparkly (which then feels dressy) tank with such beautifully colored shorts is really unique and gorgeous. Throw on a blazer and you got a very dressy look. Take it off and you have a casual but put-together look. That’s the beauty of these silk shorts. They’re comfortable (comes with elastic waistband! ), breathable, and can be dressed up with heels and jewelry for night, with blazers and button-downs for the office, or with a casual tank for weekends. Since I already own the Sequin Stripe Henley, this outfit will not be hard to recreate. Get it here from J.Crew for $88. I love the look of blazers because they make any outfit – even this one above with broken down jeans – look put together. I don’t own any blazers but I’d imagine this would be a perfect staple blazer. It’s short enough that I can even wear it with a belt, which I’m excited to try as it’s a look that is super cute on everyone I’ve seen with it. Plus, I’m not sure why but this blazer is down to $59.99 right now from $198. That’s a 70% discount! I just can’t resist. Get it here from J.Crew for $59.99. 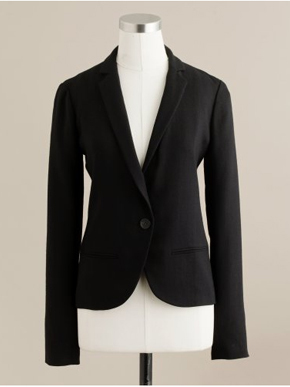 This is the quintessential J.Crew blazer. It’s cut long and lean and I’d imagine ultra flattering. J.Crew says it’s the ultimate wear-everywhere jacket and I don’t find that hard to believe. Supposedly it is also wrinkle resistant, which is a huge bonus. It’s also on super sale right now, down to $79.99 from $215. Sweet deal. Snag it here from J.Crew ASAP. As a last note, how gorgeous and versatile is the Sequin Stripe Henley? Looks stunning with this outfit. 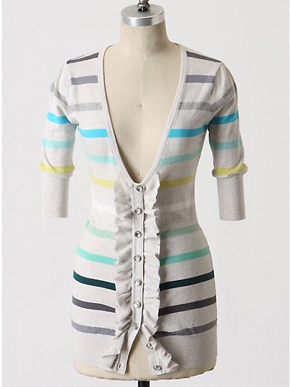 Love this cardigan for many aesthetic and practical reasons. It has many colors, so it’s super easy to match whatever else you are wearing, but unlike other sweaters where having so many colors may overwhelm the sweater and make it look like there’s too much going on, the Rise and Fall cardigan looks very simple and whimsical. I love the detailing on this as well – the cute ruffles, the flattering v-neck, and the crystal gem buttons. I’m waffling on which color to get because I love both; the blue reminds me of the beach and the red one reminds me of the sunrise. Wearing either would make me happy, but the decision may come down to which one has colors I would wear the most with the cardigan. Get it here from Anthropologie for $128. How cute is this cardigan? The whole dainty lace thing isn’t usually my thing, but for some reason on this cardigan, it’s adorable. Especially with the gold buttons. 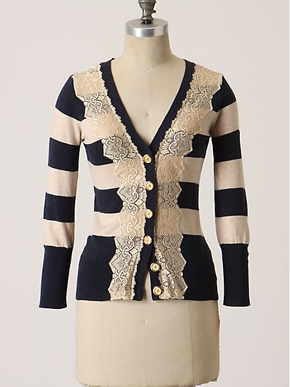 I could definitely use another short cardigan that has some oomph in the detailing. I’m just not sure which color to get, yet again. I think the grey is more feminine but I feel that may be too close to my skin tone to really stand out, whereas the gold buttons really pop better with the navy version and I’m a sucker anyway for navy stripes. I don’t think you can go wrong with either one (60 rave reviews on the Anthro site can’t be wrong!). Get them here from Anthropologie for $118.